Catch up on all the big soap moments here! This week on Fair City, Paul is enraged when he catches Charlotte letting Ruth ring Niamh. Oisin urges Charlotte to apologise when Paul cancels their music night in Vinos. Paul is angered when Charlotte makes a veiled threat to turn Oisin against him. Charlotte is suspicious when Paul asks her to manage Vinos. Paul tells Oisin he got him an interview for a dream job in London. Callum is unimpressed by Paul’s plan to split up Oisin and Charlotte. For more, click here. This week on Emmerdale, Marlon plans to secretly attend the wrestling convention, but when Paddy checks in on him he feels betrayed when he sees Marlon wearing a Bear Wolf t-shirt. Marlon convinces Paddy to attend the convention with him, suggesting he might get answers. Paddy bumps straight into Bear Wolf and chokes up as he tries to explain himself. Will Paddy get the answers he was hoping for? Elsewhere, Graham makes an anonymous call to the police about the garage and soon the police turn up with a warrant to search. 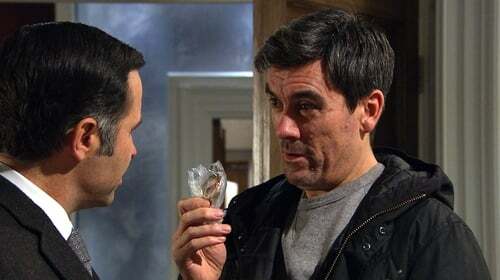 Cain confronts Graham and threatens to kill him over what he’s done. For more, click here. Shona finds a DVD on the doormat and is horrified to discover someone filmed her and David while they slept. Clayton tells her the prison bullies were behind it and she needs to help him or they will be after her. Later, Shona is cornered by two thugs in the barbers shop. Will she agree to their demands? And what will happen when Nick walks in and demands to know what is going on? Elsewhere, upset at Peter’s plans to take off, Abi hits the bottle and lashes out at Carla for keeping Peter dangling and unable to move on. Seeing how upset she is, Peter suggests she could come with him. For more, click here. Elsewhere, Shirley can tell something isn't right with Jean and tries to cheer her up at the E20. Jean ends up snapping at Shirley and storming off, before breaking down outside the club. For more, click here. On Neighbours this week, Leo is sent into a downward spiral after Terese refuses his proposal. Leo is shaken when Terese turns down his proposal, but convinces her to give things another try. Terese is still rocked by her feeling for Paul and how torn she is between them both, but decides to stay with Leo... That is, until she has a moment with Paul and can't ignore the sexual tension between them. Leo's happiness is short-lived however when Terese tells him that she doesn't think things are right between them, and she finishes things with him once and for all, leaving him devastated. For more, click here. On Home and Away this week, Dean and Colby shock Chelsea with their plans for Bella. Chelsea is relieved when she learns that Bella has been found, and that she's safe, but when she finds out that Dean and Colby have been keeping her against her will, she is horrified. What's more is, Dean and Colby enlisted Willow in keeping their secret too and helping them by bringing supplies to the hideout where they were keeping Bella. Chelsea is both disappointed in Colby for making his friends accessories in Bella's kidnapping and for how his actions could compromise their entire investigation, and in the heat of the moment she tells him they're over. For more, click here.